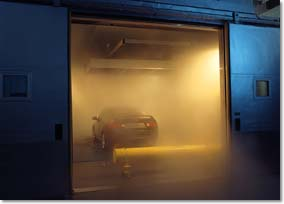 EDP Technical Services has provided the automotive and related industries with comprehensive thermal and climatic test services since 1992. Our test facility is equipped with modern drive-in test cells that can simulate a wide variety of temperature, humidity, sunlight and wind conditions for all your testing requirements. Applications include passenger vehicles, light and medium duty trucks of all fuel types- Gas, diesel, electric, hybrid, propane, natural gas, etc. Large mechanical cooling system with liquid nitrogen boost creates over 1.2 million BTU's (470 HP, 350 KW) per hour cooling capacity over entire temperature range. Over 200,000 BTU (60 KW) per hour supplemental heat. Full Solar Simulation with 1400 watts/sq. meter full spectrum light; 1000 watts/sq. meter infrared lighting. Wind simulation with 60" diameter fan. 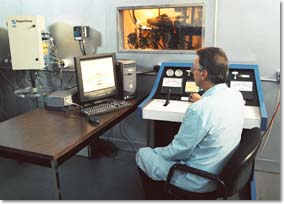 Our engine sized thermal test cell was designed specifically for testing all types of engines on stands and dynamometer carts. The test cell is also a perfect size for small vehicles. RV's, lawn equipment, larger components or racks of products being tested. Door opening 8'0" Wide by 7'3" Height. Operating Temperature -50°F to 170°F. Large cooling capacity of 310,000 BTU's (100 HP, 74.6 KW) per hour. 100,000 BTU's (32 KW) per hour supplemental heat. RapidChill TM liquid chiller system with 500 gallon tank of glycol/water mix. Variable speed flow control into cell. 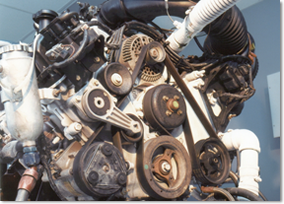 Used for engine and dynamometer cooling during test. Two (2) SuperFlow SF-902 water brake dynamometers with X control consoles. -150°F to 650°F Temperature range.